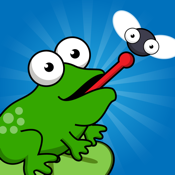 Help the frog jump along lily pads to eat all the flies! Straight forward gameplay and bright visuals create a relaxing environment that is suitable for all ages. Simple puzzles are easy enough to be picked up at anytime, but hard enough to keep you interested. Sit back and enjoy the 96 fun levels!